When it comes to choosing the perfect summer bag, every person has his/her own judging criteria. And as the seasons change, so do the style trends, and in turn, the needs of the customer. Along with being attractive, a good bag needs to meet a customer’s lifestyle. In fact, according the Advertising Specialty Institute, bags have been found to generate more impressions than any other promotional item. In terms of your business, you can take advantage of this opportunity, in order to build your brand. By rewarding current customers for their continued support, and attracting potential customers with a custom bag that’s both fashionable and functional. Utilize these suggested promotional products, and you’ve literally got sales in the bag! Customers are sure to appreciate the Barbados Tote Bag, which is a sturdy alternative to the traditional plastic bag. In two summery colors, and made of straw paper with cotton rope handles, this bag is easy on the eyes AND on the hands. You may think that it’s special enough to turn heads at summer get-togethers, but by custom printing your corporate logo on it, you can make your brand the starring feature. With each use, your customers can inspire curiosity about your brand amongst your potential clients, consequently building your audience and achieving heightened brand awareness. Your business will certainly not blend in with the competition using this fresh perspective on a standard summer bag. From the beach to the trade show to the company picnic, the Captiva Bag truly lives up to its name – captivating audiences. The simple, yet impactful design provides a huge, blank canvas for neatly screen-printing your corporate logo on the front of the bag. Additionally, you can choose from three bright color schemes that are perfect for any season. As an added bonus, this custom bag is available for free rush production 5 days after your logo art is accepted. A Captiva custom swag bag is a simply meaningful gift for customers to commemorate their positive experience with your brand. Keep your gear and accessories in, and keep out the sand, water, and dust. The Whale Beach Bag is a sturdy mesh bag equipped with plenty of pockets and tremendous storage space. It will be the perfect accessory for customers to use regularly over a long period of time in all different places. Custom branding this bag will allow customers to safely and stylishly carry their necessities, and to act as your personal marketing team. In doing so, your business can build brand awareness and recognition at very little cost to you. Your ongoing business goal is to build brand awareness and “get your name out there.” Custom promotional bags have proven to be impressive marketing tools to make this possible. 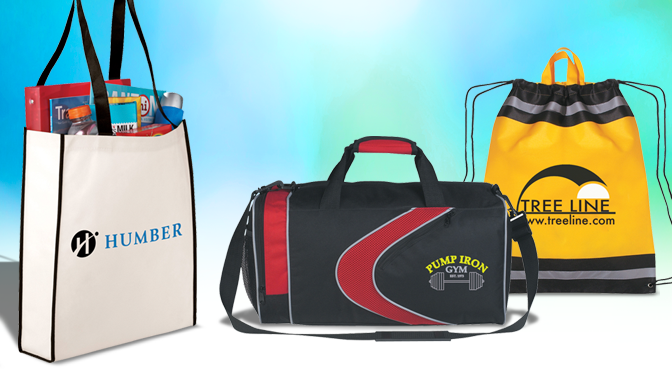 Custom bags allow you to capture the character and personality of your brand, all while building a loyal following. For more great ideas for unique, brand-building giveaways and swag, be sure to visit Pinnacle Promotions to learn how you can Make the right impression™.